It should be made clear before you read another word, that I, Olivia Mackinnon love cruising. It’s in my DNA, you see. My parents actually met while working on board what they called, ‘The Love Boat’, but I suspect it was just a regular boat, with no links to TV cruising royalty whatsoever. So for as long as I can remember, I have been wooed by the incredible grandness of cruise ships, and up until recently, I’d never been lucky enough to board one in the Azamara fleet. Landing in London and then travelling to Southampton, UK, I was instantly desperate to climb aboard Azamara’s newest ship, Pursuit as soon as I clapped eyes on her. One of my favourite things to do aboard a ship is familiarise myself with the facilities: ‘Where is the restaurant, how far is my cabin from the pool, where is the spa? !’ I’m simply not satisfied until these questions are answered. However, aboard Pursuit I was enamoured with the luxury feel of the ship. The detail in every hand rail and piece of art. As a small-time cruiser, I simply didn’t feel worthy. The common areas were furnished with incredible plush chairs, decorated with velvet trimmings and chic finishes, while the restaurant took the whole ‘white tablecloth’ dining experience to a new level with a sense of European style I haven’t ever seen on board a ship before. The feeling of luxury was extended down the hall of the starboard side – as I’m sure it was on port side – and all the way inside my cabin. The bathrooms had more sink space than I was accustomed to. There was an established seating area, a roomy balcony and a beyond-comfortable bed. In fact, with the deluxe sheets combined with the gentle sway of Southampton’s River Itchen, I don’t know if I’ve ever slept so soundly. I was particularly fond of the colour palette used in the cabins, a mix of moody greys, deep woods and a touch of blush. The marble finishes added a chic cherry to an already delectable cake. Also, the shower pressure was near-normal – maybe even on par with what you’d get at home. Anyone who has ever cruised before will understand what a big deal that is. What excited me about this trip was that I was going to get the chance to arrive in an entirely different country by the time I woke up in the morning. Yep, we were en route to Cherbourg, a port city in France where you could delight in both French naval history and quality croissants for the day. I also learned that this was the place the Titanic made its final stop on its fateful journey to America – but I tried not to focus on that as I disembarked. If that sounds appealing to you, visitors to Cherbourg are encouraged to visit Cité de la Mer, one of the port’s main tourist attractions, where you can find out more about the infamous ship’s final visit. The Pursuit frequents many European ports during its varied itineraries, which means the food always complements your destinations. During my day in Cherbourg I was treated to fresh crepes, soft cheese, macarons and sparkling wine. I pretty much had to roll back to the ship. Back on board, passengers celebrated the ship’s maiden voyage with a decadent oyster and Champagne buffet dinner. Chefs were ready and waiting at a personalised pasta station, ready to combine fettuccine with pesto, or spaghetti with carbonara sauce if your heart so desired. 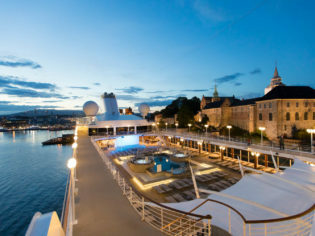 It’s differences like these that showcase the level of care – and luxury – you can expect to experience on board an Azamara ship – and from what I hear, the Pursuit’s elegance is certainly no exception to its sister ships: Azamara Quest and Azamara Journey. Despite being August, the weather was a little cooler during our short cruise, and I’m almost certain that I was the only guest to brave the ship’s water amenities. I swam not only in the pool’s accompanying spa on the main deck, but also in the larger spa provided to guests before their scheduled treatment, as an indulgent precursor to what is already guaranteed to be a ‘cloud nine’ level of pampering. Due to the lack of company in the spas, I felt there was more than ample room – my only gripe would be that they could be made a little warmer – however on a standard August day in Europe I imagine the cooler temperature would ordinarily be ideal. The thing that makes the Azamara fleet different to regular luxury cruises is its desire to get passengers off the ship at port and truly immerse them in the activities and culture of that destination. This is what they call their ‘Destination Immersion’ programming. For example, during my time in Cherbourg on the Pursuit’s maiden voyage, in addition to being treated to iconic French delicacies, we were also wowed by a side-splitting performance by a French dance ensemble. The short itinerary meant that while a full-day of exploration wasn’t an option, Azamara brought a taste of Cherbourg’s culture to us at port – and we loved every second of it. 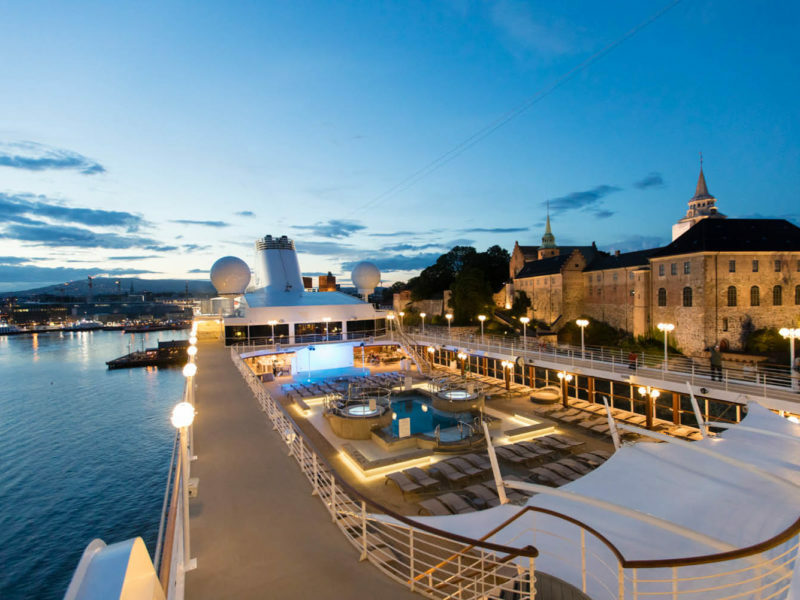 Sailings with longer itineraries can expect even more incredible immersive experiences. From a three-day/two-night stargazing experience in Chile’s Atacama Desert, to exploring the inside of a volcano in Iceland, they somehow manage to make it about guaranteeing you have as great of a time off the ship as you will on board. As of 2019, Azamara’s very first Melbourne departure will take place – and the list of destinations worked into their itineraries is longer than ever. This year, the ships will visit a record 250 ports across 69 countries with 94 overnight stays and 145 late-night stays – meaning you get the most out of the places you want to visit. Plus, this year marks the first visit to Alaska – yippee!